Webcams, speakers, mice, and all the other cool gadgets you'll need this year. There are always more handy gadgets you can get that can do the job better than your current technology. If you want to find a headset with better sound quality, an HD webcam, a better microphone, or even a pen which will take digital notes and record everything that’s going on around you, you’ll find it, and more, below. We’ve gone for a good balance between quality and price, so these items won’t empty your bank account too much before the start of the next school year. A webcam can be useful for a number of reasons. Maybe you need video for an important conference call or interview, perhaps you need to snap an image of something for work, or maybe you just want to Skype your cat at home. No matter what need you have, the Logitech C920 should cover it. It’s fairly expensive for a webcam, but that’s because it’s simply the best out there. Even with a high price tag compared to others on the market, it’s not exactly bank-breaking. The C920 captures 1080p video, it’s got H.264 video compression, and built-in dual stereo mics with automatic noise reduction. Plus, if you download Logitech’s webcam software you’ll have access to the handy auto-image adjustments. It’s great at adapting to differing light levels, but you might want to tweak white balance and saturation if you’ve got the time. The stand will attach to just about anything, so it’s fine for both desktops or laptops. In addition, it’s fairly compact, so if you do need to carry it around, the 7.7 ounces it weighs won’t make much of a difference. Microphones are an area you can end up spending a lot of money in if you want the highest quality. The best one for most people, i.e. it will record excellent audio quality and you can use it for voice chat in games easily, is the Blue Yeti. For the price it has the best audio quality around, and although you can spend hundreds and hundreds of dollars for better, it’s generally not worth the trade off. The Blue Yeti will sit just about anywhere on your desk without too much of a dip in quality, which gives it an advantage over other microphones which start sounding metallic the further away they are from your mouth. It’s got a nice sturdy base, and some padding underneath which will reduce things like keyboard sounds. The Blue Yeti looks great too, and although it’s not quite professional quality, it certainly looks like it. Razer makes some of the best mice around, and although the DeathAdder Chroma is technically a better overall mouse, the Razer Mamba Chroma has an added bonus of being wireless. So, you’ll be able to transport it around without all the hassle you get from wires, but once you get home, you can actually use it wired if you prefer. Either way, Razer says it has a response time of 1ms, so you won’t notice much difference. 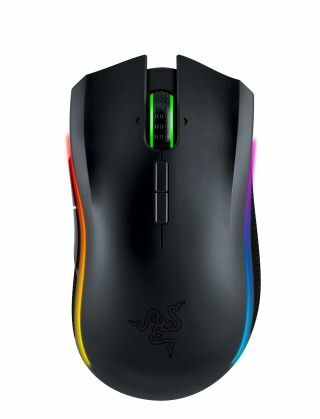 It looks nice too, and although it has the varying colors all the Chroma mice have, Razer hasn’t gone too crazy with the design. As for features and performance, the Razer Mamba Chroma boasts 16.000 DPI with one of the most precise sensors out there. Plus, the buttons have an adjustable click force mechanism meaning you can choose different levels of actuation force for what you need. It won’t be useful for just browsing the Internet, but if you’re playing a lot of games with it you might want a bunch of customization options. A portable keyboard is always a handy thing to have around, especially when you can connect it to multiple devices and switch between them at will. The Kensington KP400 does exactly that, as you can have it connected via USB to your laptop, and then quickly switch to a tablet or smartphone via Bluetooth at the touch of a button. It is a full sized keyboard though, meaning it’s a bit less portable than some wireless tenkeyless options out there. It’s not the most stylish looking thing either, with its simple black and white design. However it makes up for it with its functionality. It’s fairly expensive for a basic keyboard, but it does save you having to buy an extra keyboard for another device, so it balances out. You always need a good headset, whether you’re watching movies on your laptop, listening to music on your commute, or playing games. We’ve got a couple of options for you here, an excellent quality wired headset, and below you’ll find a great budget wireless one. Kingston’s HyperX Cloud Revolver is pretty new, and improves even more upon the fantastic Cloud and Cloud 2. Best of all, we gave it our top pick after taking a look at 26 other different headsets. The sound quality is right up there with the best, it’s well balanced across bass, mids, and highs, and it’s nice and comfortable too with memory foam in the ear cups. Your volume controls and mute functions are on a box attached to the wire, and it’s even got a good quality detachable microphone, which will be useful for everything from gaming to Skype calls. The first UE Boom was one of the best Bluetooth speakers around, and the UE Boom 2 improves upon it and adds waterproofing (for about the same price). If you want a portable speaker that sounds great and also looks very cool, this is the way to go. If for some reason you already own a UE Boom and want the upgraded version, they’ll actually link up via the companion app. It’s a cylindrical speaker so you get a great range of sound from all angles, and it has some cool features such as being able to pick up the speaker and tap it to perform various functions. Tapping once changes the song, tapping twice skips a song, and tapping three times goes back. The new version of the UE Boom has a bunch of extra color options too, ranging between simple black up to orange and purple. There’s a computer in everything nowadays, even inside your pen. At least, inside the Livescribe Pulse Smartpen. It has a built-in camera and uses special paper which means it’ll capture everything you write. On top of that, it has a microphone which will record what’s happening around you as you write, and sync up the image captured from the camera to the audio. Then, when you want to go back to your notes, simply tap on a word and it’ll begin playing the audio from that moment. It’s really smart technology, and can be handy if you want to take digital notes while you’re away from home and a keyboard isn’t feasible. It comes in 1GB, 2GB, and 4GB options, depending on just how much you need to capture. The only problem here is the technology makes the pen a little bulky to hold. The Audioengine A5+ speaker set is one of the best options around for a 2.1 system. You’re getting top notch audio quality for around $400, and if that sounds too expensive you can downgrade to the older Audioengine 2. The price of the A5+ is really competitive for the quality, though. The sound is clear, and they’ll get really loud without sacrificing quality if you want them to. They’re big, measuring 7.8 x 7 x 10.8 inches, and they weigh a combined total of 25 pounds, but that’s about the normal size for higher quality speakers. Just make sure you’ve got enough space on your desk before investing. You’ve got the option of black, white, or even a bamboo style finish, but you’ll pay a bit more for that design. They’re really simple to set up, and you’ve got a handy remote control for the volume. These are just a good all round pick if you’ve got the cash.